CRAZY DISCOUNT! Was: $499.95 Now: $149.97! This 4-in-1 games table equals fun for the whole family! The main table unit houses each game easily and it comes complete with all accessories you need for each game. 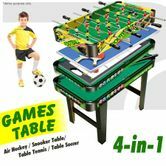 Stack them on top of each other and separate them easily to reveal tables for playing foosball or table soccer, table tennis, air hockey and pool!. Switch between games quickly and easily - this is the perfect entertainment unit to play with your family and friends. Having all four games stored neatly in this wooden table unit means it won't clutter up your home and saves you on storage space! Simply stack away the individual game boards and accessories on top of each other - no mess at all! Found one board was missing contact the seller sent the missing part quickly.